For a band still regarded as cheeky chaps with a simple, innocent boy-next-door charm, Lennon’s admission on arriving by plane to the Bahamas gave the game away about their drug use. But Lennon wasn’t joking. Fortunately at the time, the interview wasn’t used in print and, according to the Dangerous Minds website, “it remained buried on the reporter’s tape”. On February 22, 1965, the Fab Four, together with fellow co-stars, departed London Airport aboard a specially chartered Boeing 707 BOAC – Cunard flight for the Bahamas, via New York to film the band’s second feature film, Help! George Harrison gave further insight to their ‘in-flight entertainment’: “Brandon De Wilde was an actor, a James Dean type. He liked The Beatles' music and he heard we were going to film in the Bahamas, so he came over from the States with a big bag of reefer. 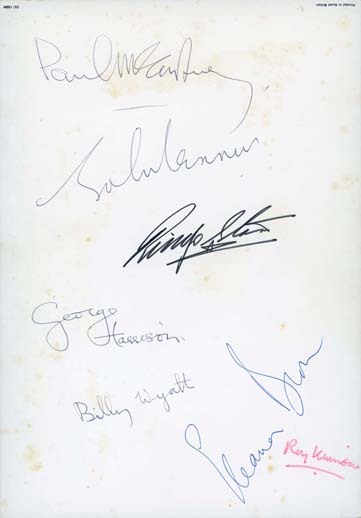 Fifty-three years, London saleroom Spink is offering the menu from that very flight signed by all four Beatles, together with co-stars from Help! 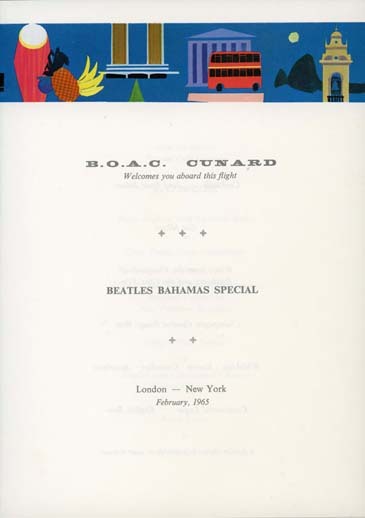 The BOAC – Cunard Lunch and Afternoon Tea Menu comprises an outer card menu of colourful and artistic design, 4.5 x 11in (27 x 19cm), the back cover of outer card signed (descending the page) Paul McCartney, John Lennon, Ringo Starr, George Harrison, together with extra autographs from Eleanor Bron, Roy Kinnear and Billy Wyatt, all signed in black or blue biro with the exception of Starr (black felt tip) and Kinnear (red felt tip). The signed menu is estimated at £5000-6000 in the Spink auction on July 24-25. It was gifted to the pilot of that flight, Wing Commander EE ‘Rod’ Rodley, DSO, DFC, AFC, and has been consigned to auction by his estate. Rodley’s medal group is actually offered as the lot before this menu in the Spink sale, estimated at £8000-12,000. His outstanding wartime service suggests a plane full of stoned popstars and entourage would not really worry him that much. 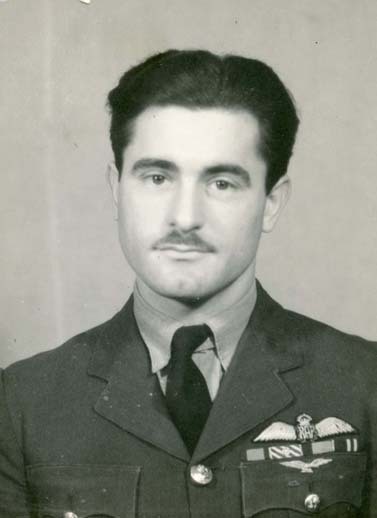 His medal group is one of just seven such combinations of gallantry awards won by the RAF in the Second World War. A long-serving pilot of No. 97 Squadron, who often acted as Marker in Path Finder Force operations, Rodley amassed an impressive tally of 76 operational sorties, among them the famous attack on Peenemunde in August 1943. Dangerous Minds has a copy of the Lennon Bahamas interview available on its website and a longer article about the background to the Bahamas trip.